2015 AUDI A4 B8 SILVER 4CYL 1.8L TURBO PETROL CVT TRANSMISSION. DISMANTLING AT OUR BRISBANE BRANCH ON 20/9/2016. 2013 AUDI A4 AUTO QUATTRO 4CYL 2.0L TURBO PETROL 7 SPD AUTO. DISMANTLING AT OUR SYDNEY BRANCH ON 20/9/2016. 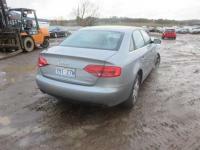 2013 AUDI A4 B8 4CYL 2.0L TFSI PETROL CDNC 7SPD AUTO. DISMANTLING AT OUR SYDNEY BRANCH ON 15/9/2016. 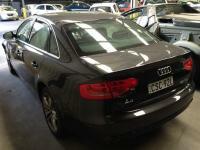 2011 AUDI A4 B8 QUATTRO BLACK WAGON 4CYL 2.0T PETROL 7-SPEED AUTOMATIC DISMANTLING AT OUR SYDNEY BRANCH, COMMON PARTS SUCH AS : ENGINE, TRANSMISSION, AC COMPRESSOR, ABS PUMP, FRONT BAR, REAR BAR, BONNET, BOOT LID, HEADLIGHTS, TAIL LIGHTS, DOOR MIRRORS, CATALYTIC CONVERTER, , COMBINATION SWITCH, DOORS, DOOR LOCKS, , DRIVESHAFT, ECUS, EXHAUSTS, FUEL PUMP, GUARDS, RADIATOR, TAIL GATE, ETC..
2011 Audi A4 4cyl 2.0L Turbo Diesel DISMANTLING AT OUR SYDNEY BRANCH ON 5/9/2016.